Cool silver stylish Acer Aspire E3-111-C5GL with the unique FlowCurve design is a compact and portable 11.6 inch laptop for those with on-the-go lifestyles. The 5 hour battery life, lack of fan- very quiet and cool operation, entry level but adequate processor, memory and storage for what it is designed to do and a good variety of connectivity options.. Looks good and performs well in basic day-to-day tasks. Acer Aspire E3-111 comes with a dual core 2.16 GHz Intel Celeron N2830 processor (1 MB Cache) with Intel Burst Technology that takes the speed up to 2.41GHz when the task at hand requires it, 2 GB DDR3L SDRAM memory for sufficient multitasking capability, 320 GB Serial ATA hard drive at 5400 rpm spindle speed and Windows 8.1 operating system.. This is a daily stuff system that will let you chat on Skype, surf the web, run Office applications, prepare school assignments, play light games, listen to songs and stream videos comfortably. For more complex tasks that require much more memory like multimedia editing, 2GB RAM would have a hard time handling them. 320GB is not a lot of hard drive space but more than enough for many people and there is the AcerCloud as well for those more important files they can access on different devices at different locations where there is internet. 11.6 inches HD ComfyView LED backlit display with 1366 x 768 max pixel resolution, widescreen 16:9 cinematic aspect ratio and Intel HD Graphics with a dedicated system memory of 64MB offers nice visuals with lively colours. The screen supports 720p HD quality image so it is not Full HD but screen size being only 11 inches you’ll get to experience better picture and graphics than you would on a 15 inch screen with the same pixel resolution and the fact that the integrated graphics card has its own 64MB of memory, unless for example you’re playing more demanding games that require more memory, the system memory won’t be dynamically shared. If you need better viewing experience, just connect the PC to your HDTV through the HDMI port and enjoy your movies on a bigger screen. Other connectivity options include 2 x USB 2.0 Ports, 1 x USB 3.0 Port, 802.11b/g/n Wireless LAN, Bluetooth 4.0, Gigabit Ethernet with RJ-45, an HDMI Port with HDCP Support, Secure Digital Card Reader and a built-in webcam with microphone. 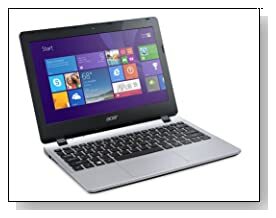 There is no DVD/CD drive on this model, which helps the slim and lightweight factor (and not many laptops do these days anyway): Functional and stylish with the unique FlowCurve design and hairline brush finish Acer Aspire E3-111 weighs just 2.84 lbs and has the measurements of 11.46 x 8.31 x 0.83 inches, comes with a 2640mAh 3-cell lithium ion battery that gives you around 5 hours of average battery life. Despite its small size it comes with an ergonomic proper keyboard with spaced out keys and Acer Precision Touchpad that supports Win 8 gestures and gives you the kind of flexibility you’d have with a touchscreen computer. Conclusion: Acer Aspire E3-111-C5GL is a very affordable 11.6 inch screen compact laptop with the connectivity ports you need, just the right amount of processor power, memory and storage space, Windows 8.1 platform with its customisable tiles and apps, fanless design- quiet and cool operation, Precision Touchpad and comfy keyboard, slim body and lightweight- portability and 5 hour battery life in average use.. There is no DVD drive and no 10-key numpad and 2GB RAM can be a little limiting for multitasking if you’re going to run demanding programs at the same time and this is not a gaming machine you can play the latest 3D games on but other than these small cons, you’re getting great value for your money- it is a very low cost machine suitable for everyday home use, home office, entertainment and travel as it will fit in your bag easily.